Prague has excellent rail connections to many smaller cities and towns in the Czech Republic. Taking day (or weekend) trips, especially if you’re staying in Prague for an extended time, is pretty easy. Kutná Hora was our first destination. Kutná Hora hl. n is close (about a 10 minute walk) to the Sedlec end of the town. In Sedlec (a small suburb of Kutná Hora) are two famous sites: the Sedlec Ossuary and the Church of the Assumption of Our Lady. I’d heard of the Ossuary before, and that was the main reason we were in the town. Getting to the ossuary was pretty simple – there were some signs pointing in the right direction (follow those labelled “Kostnice”). When you get to the ossuary, you can buy a ticket for up to four attractions: the ossuary and the Church of Our Lady (both in Sedlec), and the Church of St Barbara and the Jesuit College (in the Kutná Hora town centre). The Jesuit College was closed on Mondays so we didn’t go. The admission was 160Kč (~$8) for the three attractions. The ossuary was neat. It was a lot smaller than I was expecting – basically one room, with a tonne of bones. 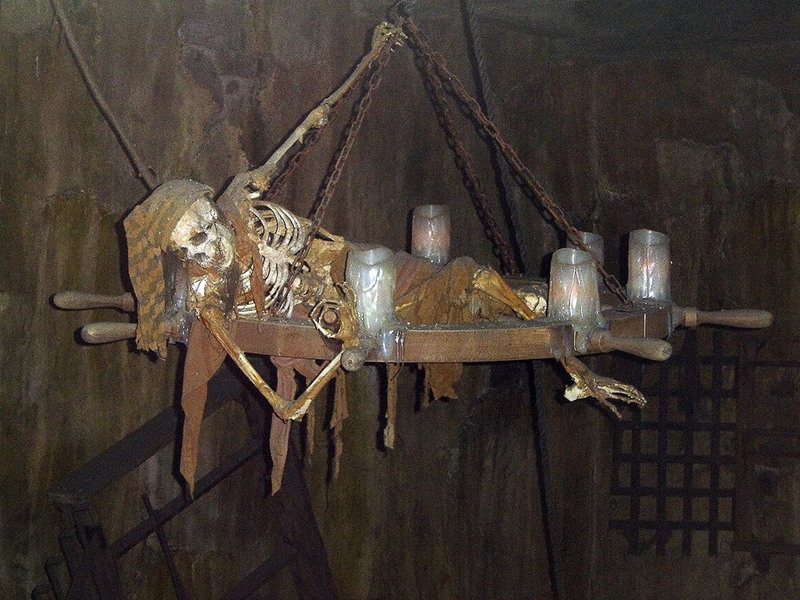 It was creepy, but the number of tourists taking photos in there made it feel more like a room in the Pirates of the Caribbean queue. Bones, skull and crossbones, bone chandelier, bone signature. They hand out laminated sheets with some information on them, so you get a little historical information. However, I’d recommend either loading up Wikipedia or having it on your phone for more detail. Coat of Arms in bones, cause, y’know, why not? After the ossuary, we went to the Church of the Assumption of Our Lady. We were the only people in there. It was a little strange – I’ve not really been in a Gothic-looking cathedral where all the walls are painted beige/yellow. Aside from a couple of garishly-dressed relics it was pretty dull. I wouldn’t recommend going but it’s a bit of a waste as you walk right by it heading into town from the ossuary. There are supposedly a number of buses that go from the ossuary into the centre, but we decided we’d walk it. The best thing I can say about the walk from Sedlec into Kutná Hora proper is that it was about 40 minutes and got us a fair few steps on our fitbits. The walk is mainly through industrial and suburban parts of the town, and for the most part there’s not much to look at. However, once you get into the centre itself, Kutná Hora is gorgeous. There are a number of winding cobblestone back-streets with beautiful buildings. I think we could have spent a few hours just wandering around the town. We had a quick lunch at Café Harmonia, which had amazing gnocchi. Then we headed for the next church on our list: St Barbara’s. The walk up to the cathedral was beautiful – there’s a promenade-type thing with statues along it that reminded us of Charles Bridge. From the promenade you get a great view looking over Kutná Hora. Inside, St Barbara’s was amazing. Much better than the Church of the Assumption of Our Lady. There were murals all along the apse and the sides of the nave. There were a few stained glass windows from the 1910s, which were neat. The one which I found interesting was from 2013. I find modern stained glass intriguiging as it’s not really a standard modern art form (aside from Gilbert and George). After we had explored the cathedral, we started our journey back to Prague. Rather than walk the 40 minutes back to Kutná Hora hl. n., we went to the station in the centre of town – Kutná Hora město. It’s tiny and rural, without any real platforms. There’s a shuttle train that runs between this station and the main station. When we arrived, the next train was in 40 minutes(! ), and we didn’t have much choice but to wait for it. We changed at the main station to a train to Kolín. From Kolín to Prague we ended up on the Berlin train, an EC-class train. It was slightly nicer than the R-class we took on the way there, but not by much. It ended up taking us about two hours for the return journey. I’d recommend timing your trip back carefully. All in all it was a pretty nice day trip. If you’re travelling around the Czech Republic, or you’re staying in Prague for a while and want to get out of the city, it’s a fun thing to do.